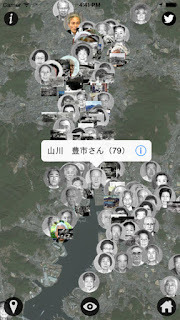 We developed "NagasakiARchive" Smartphone Apps of "Nagasaki Archive" with GPS map and AR technology. Below is the special program about "NagasakiARrchive" by Nagasaki Broadcasting Corporation in 2012. In the "Map mode", the data is displayed by markers on the 2-D map. 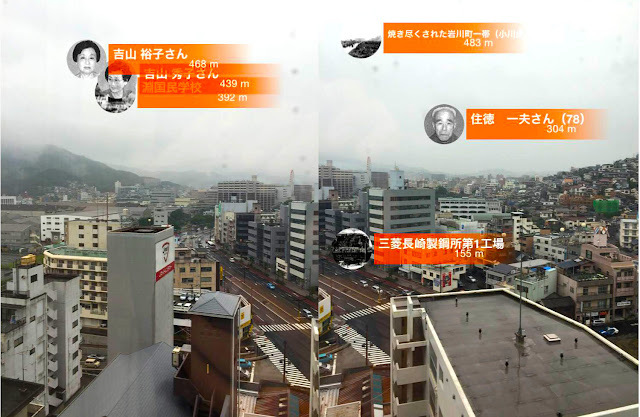 Especially at Nagasaki, The Users can view the past situation around themselves beyond the time using a GPS function. In the "AR mode", the situation of Nagasaki in 1945 is displayed as overlays on the real Nagasaki's actual cityscape. The user can feel the disaster situation of Nagasaki in 1945 realistically. “NagasakiARchive” supports Twitter function. A hashtag “#nagasaki0809” and geo-information are attached to user's tweets.